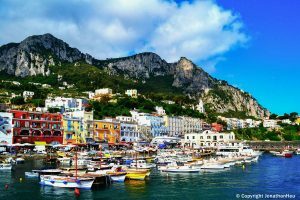 The beach of Marina Grande is the largest of Capri, adjacent to the port of docking of hydrofoils and for this attainable on foot in just two minutes. Marina Grande is the ideal solution for those who have little time to spend in this fascinating island, with its expanse of white pebble, its crystal water despite proximity to the port and its sand foreshore perfect for the children. On the beach there are two bathing establishments with restaurants, while the free zone is at the end of the beach, on the cliff. – private boat or boat rental.